FasciNature™ will provide an unforgettable experience with live animal programs and seminars which are adaptable for all ages. 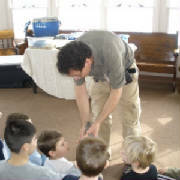 Educator Mark Carra will introduce you to some of the most amazing creatures found on planet earth. Each seminar or presentation is geared toward your specific needs and group. Choose from a thrilling list of presentations or ask to custom-build a course to supplement lesson plans or to match your groups interests.